And just like in the 2008 NFC Championship Game, the New York Giants, on the road, won on a Lawrence Tynes field goal in overtime that sent them past the San Francisco 49ers to Super Bowl XLVI by a 20-17 score. It was a pretty ugly game all around due to the terrible weather at Candlestick Park and there was not much offense throughout the game. Both teams had multiple chances to come out on top in regulation as well as in overtime. What set the Giants up for the win was when 49ers punt returner Kyle Williams, filling in for an injured Ted Ginn, was stripped by the Giants' Jacquian Williams at his own 24 yard line and New York recovered. The Giants then moved the ball a little to set up Tynes for his game-winner from 31 yards out. The Giants are going to be taking on the New England Patriots in two weeks in Indianapolis in a rematch of Super Bowl XLII and we all know how that one turned out. 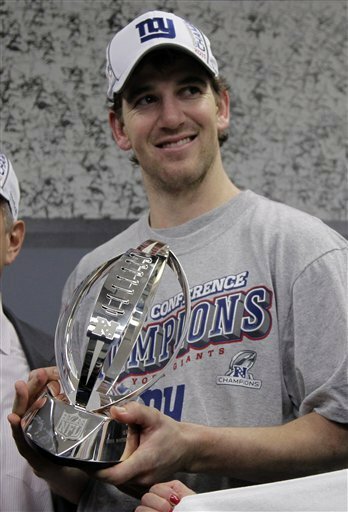 The Giants will be going for their fourth Super Bowl title and second under Tom Coughlin. And my predictions were right for once. Watch the highlights of the game here and watch the presentation of the Lamar Hunt Trophy here.